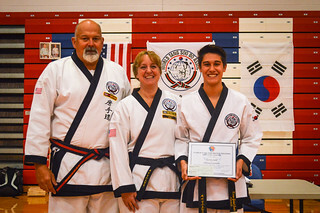 Two of the Region’s Black Belts were awarded a $2000 scholarship at the Region 22 Fall Dan Test, held on September 12th at the Richland High School in Johnstown, PA. Scholarship Winner Kiran Judd is a Cho Dan from A Mountain Wind Martial Arts, in State College, PA.
3 years ago ago by Region 22. Mr. Judd is a first-year student at Penn State, and is working toward a degree in the College of Engineering. He has been a member of the WTSDA since 2002. 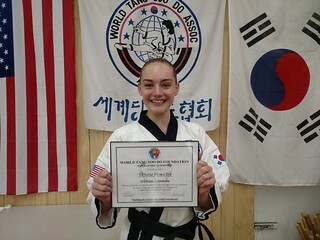 In her scholarship application essay, Scholarship Winner Victoria Homschek, E Dan from River Valley Tang Soo Do Academy in Ambridge, PA, elaborated on the benefits of her Tang Soo Do training. Ms. Homschek has been a member of the WTSDA since 2000, and is a first-year student at Slippery Rock University. She is working toward a degree in Dance and Elementary/Early Childhood education.